Leading Leave campaigners dished out false and undeliverable promises like Bullingdon Club bullies dishing out banknotes at a high-class restaurant they’ve just trashed. The whole Brexit argument itself was based on gross deceptions, sentimental nonsense and misrepresentations. Their victory wasn’t overwhelming. And it’s just patently revisionist nonsense to say the vote for Brexit was some kind of ‘working class’ rebellion. The most working class parts of the UK – Glasgow, Liverpool, Manchester, Newcastle, Peckham etc – all Remain strongholds. And vast majority of young people voted Remain too. Remainers are now in the majority and that majority is growing day by day. Not just because reality hits hard, but because hundreds of young people join the electorate every day while aging Brexiters die. Democracy doesn’t mean accepting bad decisions made by a bare majority of voters - many of whom were uninformed of the truth and were whipped up into a frenzy of fake news and lies from the mouths of manipulative politicians, backed by dodgy money from tax-exiled billionaires. Democracy means fighting for what’s right and to reverse decisions which will be damaging to the future of our country and our children’s future. The referendum result was NOT democracy in action. It was an assault on democracy. That's why we need to revoke article 50 NOW. FELLOW ANTI-BREXITERS AND REMAIN SUPPORTERS - THIS IS IMPORTANT. 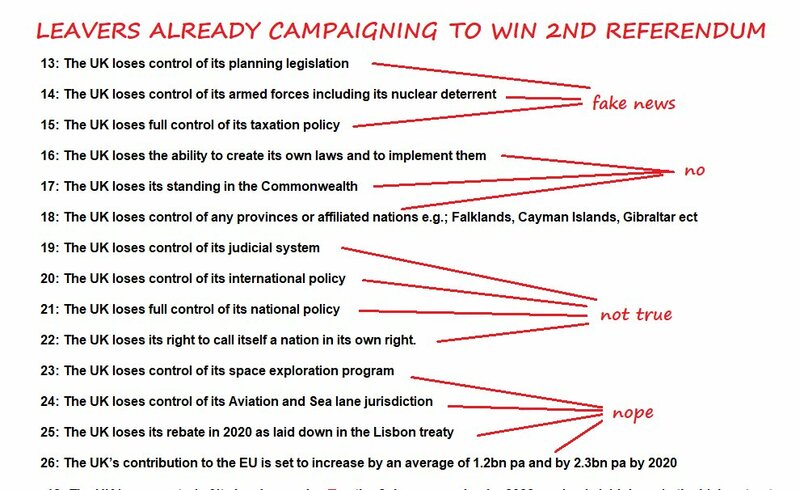 Leavers have already started campaigning on social media to win a second referendum - with even more extreme lies than in the first referendum. This is happening right now, and we cannot afford to ignore it. This fake news is ALREADY being shared extensively by Leavers, especially on Facebook and Twitter, with lies about what is going to happen if the UK remains in the EU. And it is already 'leaking' onto the timelines of ordinary voters - many of whom may believe the lies. 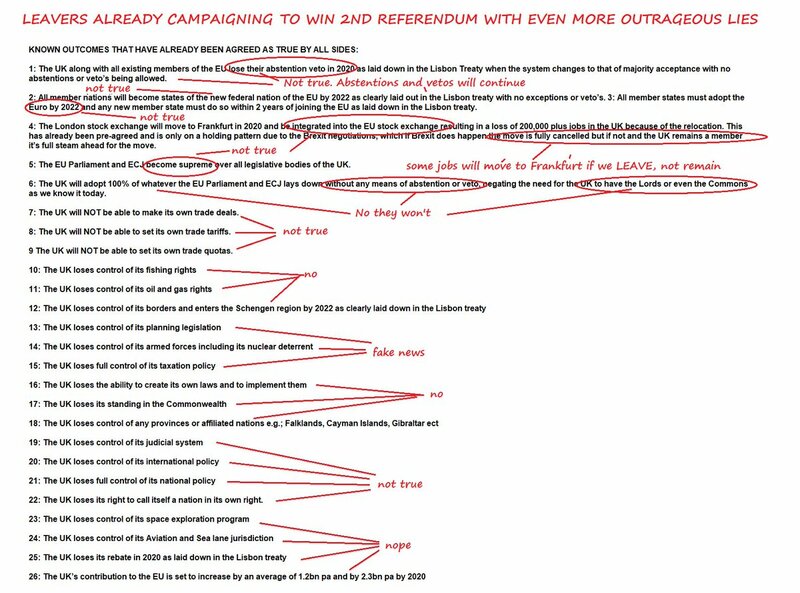 I have posted the main points of the fake news being shared below - the original posts are much longer than this, and are quite well written, so could be believed by a lot of voters. This meme is my first attempt to debunk these lies. The biggest lie I've heard about Brexit - and there are oh so many - is that Brexit was some kind of 'working class rebellion. The most working class parts of the UK - Manchester, Liverpool, Glasgow, Newcastle, Peckham - were all Remain strongholds. Jacob Rees-Mogg, Rupert Murdoch, Paul Dacre, Liam Fox and Boris Johnson et el do NOT represent the best interests of workers. It's more than bizarre this has to be pointed out. So those TINY minority of Brexit supporters on the Left, please stop making out being anti-Brexit is some kind of 'centrist position. It's not. #BTselem is a “disgrace,” PM #Netanyahu said on October 14, 2018 as he lashed out at the left-wing #Israeli NGO over its plans to speak out against #Israel at the #UnitedNations Security Council later that week. KIDS IN CAGES in 2018 but It's not what you think! The KIDS were USE for Protest against @POTUS immigration Policies Inherited fr OBAMA Admin but no one dared to speak during the "KING"s REIGN"
1. What do these products have in common? They have all been certified kosher by one of the 225 kosher certification agencies in the US. 3. Currently, there are about 1.5 million products that are certified kosher. To obtain certification, manufacturers must contact a Jewish certifying agency and pay a fee for a Rabbi to fly out and inspect the ingredients, equipment, & cooking process to make sure they're kosher. If you thought the silly nonsense of "pizzagate" reached its nadir when someone invaded a pizza restaurant with an assault rifle demanding to see its (nonexistent) basement and after that it must have died down... it didn't. The people invested in "pizzagate" are playing an alternate reality game in which they have invested everything. I mean,not anything so cheap or tawdry or tenuous as money. I mean everything. Themselves. Their hearts. Their souls. And when they encounter a breaking point, something that would absolutely, positively, and concretely prove to them that reality is 100% different from what their beliefs say it should be, they just tack a modifier onto their beliefs to account for it, taking them deeper.